“Pickles” are American parlance for pickled cucumbers. Elsewhere, “pickles” refers to any pickled vegetable. Photo by courtesy Emmy’s Pickles & Jams. This is Page 2 of a seven-page article, plus six pages of reviews of artisan pickle brands. Here, a history of pickles. Click on the black links below to visit other pages. 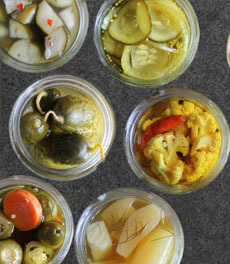 If pickle makers agree on nothing else, all agree that fermented pickles are an ancient food. Michael Pollan declares that, before modern-era canning and refrigeration, fermentation was the most widely used method of food preservation. Earthen pits were lined with leaves and filled with various foods. The earth maintained a low, steady temperature and may have contributed some microbes to speed the fermentation process. Naturally-present lactobacilli would begin fermentation within a matter of days; enough lactic acid would eventually be produced to preserve the food, sometimes for years. A pickle timeline drawn up by the New York Food Museum goes as far back as 2400 B.C.E., when anthropologists and archeologists believe that the Mesopotamians might have engaged in pickling. Cucumbers are mentioned twice in the Bible. Aristotle praised the healing effects of cured cucumbers in 850 B.C.E. Flash forward to a great event in pickling: Around 900 C.E., dill, one of the best-loved herbs in pickling, was introduced to Western Europe. While pit fermentation is still carried out in some areas of the world, more modern societies have exchanged earth pits for earthenware crocks or other non-reactive vessels. No more fermenting in earth pits for modern societies. We’ve got sanitary barrels and tanks. Photo courtesy Grillo’s Pickles. 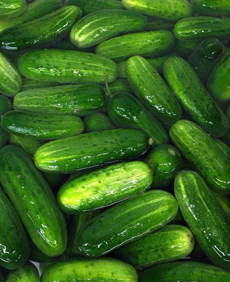 By 1659, Dutch farmers were growing cucumbers all over the area now known as Brooklyn. The cucumbers, sold to dealers, were cured in brine and sold at market stalls on busy thoroughfares. New York City thus became home to the world’s largest pickle industry, according to The Lower East Side Tenement Museum. Successive waves of immigrants to the U.S. in the later 19th and early 20th centuries helped to popularize pickles, which were cheap, plentiful, available year-round, and brought back memories of the lives and lands the immigrants had left behind. Pickles are a tangy, low-calorie snack. Photo courtesy Gordy’s Pickle Jar. If you’ve ever wondered why New York City has such a long-standing and extensive history with pickles, now you know. In 1858, the first Mason jar was designed and patented. 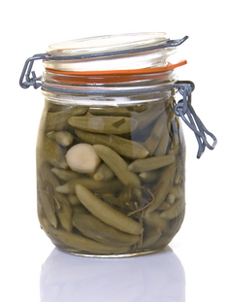 John Mason developed the jars specifically to withstand the high temperatures necessary for sterilizing pickles. Here’s more history of the Mason jar. Many people were engaged in pickle production. In 1893, Pickle Packers International, the first trade union for workers in the pickling industry, was founded. As spicy foods gained favor in the U.S. in the latter part of the 20th century, many pickle-makers incorporated that preference into their products. 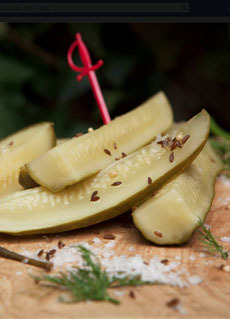 Pickles mild and hot remain a popular snack in the U.S. to this day. A variety of mason jar. Photo by Edith Layland | Dreamstime.